When it comes to planning a holiday party, what do you think about first—the drinks? Check. The snacks? Yes. How about the favors? When it comes to planning a holiday party, what do you think about first—the drinks? Check. The snacks? Yes. How about the favors? 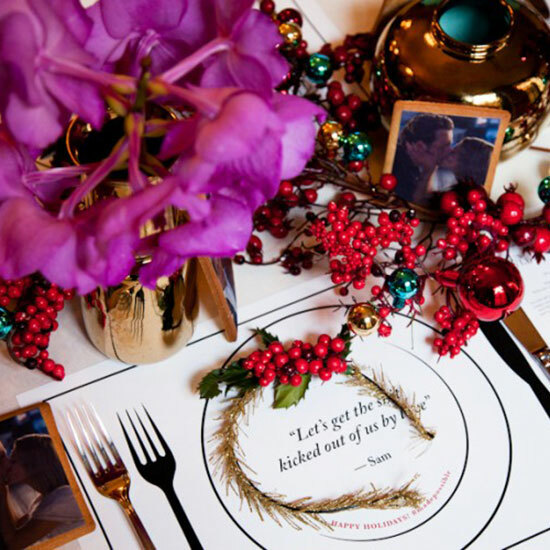 At a recent New York brunch for fashionable she-bloggers, the lovely Pippa Lord of Sous Style ingeniously planned a theme around a DVD revealed to each guest when she pulled out her chair: Love Actually—the cult holiday rom-com that even dudes apparently watch on repeat. Quoth Pippa, “Don’t we all want to live in a world where Hugh Grant is Prime Minister?” Maybe. But we definitely want to have a festive weekday brunch with cool girls, jewel tones and cookies decorated with edible photos of Hugh Grant. Continuing the Brit theme, attendees chatted with English bloggers Hemsley + Hemsley via Skype. The duo contributes to Sous Style and created the healthy breakfast dishes on offer (and served by Tribeca’s All Good Things) including frittata, veg fritters and spicy coconut milk hot chocolate. See the full table setting over at Sous Style.